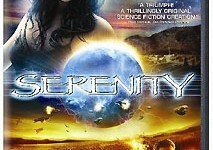 Joss Whedon- the Oscar®- and Emmy-nominated writer/director responsible for the worldwide television phenomena of "Buffy the Vampire Slayer" and "Angel"-now applies his trademark compassion and wit to a small band of galactic outcasts 500 years in the future in his feature film directorial debut, "Serenity". The film centers around Captain Malcolm Reynolds, a hardened veteran (on the losing side) of a galactic civil war, who now ekes out a living pulling off small crimes and transport-for-hire aboard his ship, Serenity. He leads a small, eclectic crew who are the closest thing he has left to family - squabbling, insubordinate and undyingly loyal. When Mal takes on two new passengers-a young doctor and his unstable, telepathic sister-he gets much more than he bargained for. The pair are fugitives from the coalition dominating the universe, who will stop at nothing to reclaim the girl. The crew that was once used to skimming the outskirts of the galaxy unnoticed find themselves caught between the unstoppable military force of the Universal Alliance and the horrific, cannibalistic fury of the Reavers, savages who roam the very edge of space. Hunted by vastly different enemies, they begin to discover that the greatest danger to them may be on board Serenity herself.